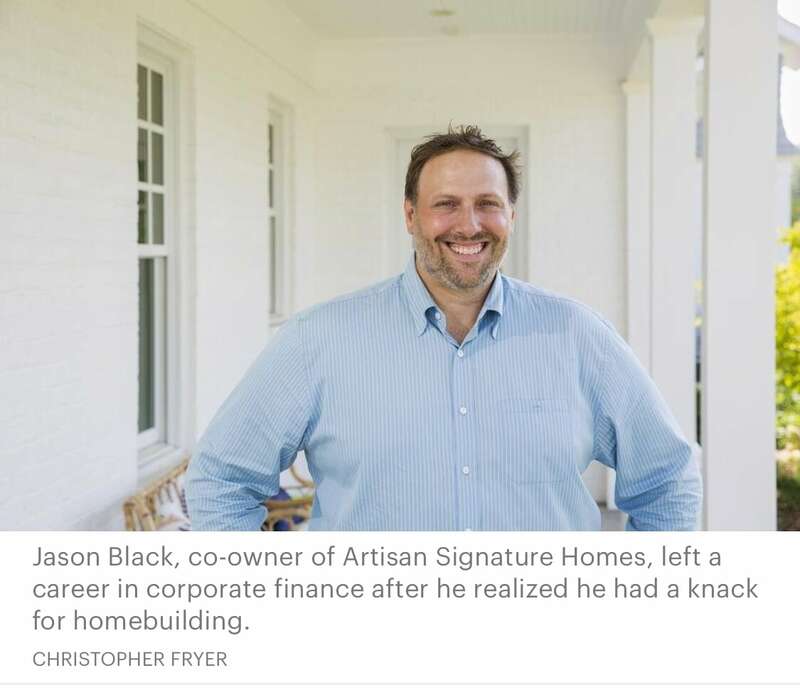 Jason Black, co-owner of Artisan Signature Homes, left a career in corporate finance after he realized he had a knack for homebuilding. If you’re Jason Black, you parlay a side job into a new business venture. Black co-owns Artisan Signature Homes with high school friend Jimmy King and serves as president. The luxury custom homebuilder specializes in highly intricate construction that requires a lead time of about a year-and-a-half to design and build the home to a client’s specifications. Because of that, the company builds about eight homes a year at an average cost of $1.5 million in the East End, including Norton Commons, Anchorage and Glenview. “We’re concerned more with quality than quantity,” Black said of the business. The company began nearly three years ago after Black sold his stake in Louisville-based Stonecroft Homes where he had been for more than 13 years. But prior to entering the homebuilding world, Black spent several years in corporate finance, first working with Kindred Healthcare Inc. predecessor Vencor Inc. before moving on to a position with Humana Inc. The move could be viewed as a natural progression for Black, who earned his MBA at Bellarmine University, where he also played golf. Golf consumed Black’s life growing up in Louisville, but he always appreciated the design and architecture that went into the homes near his own as he traveled to area golf courses. He pursued the MBA when he realized he would never play professional golf and found success in the business world, hence the career progression. But it was clear to him that finance was not his calling. “I was just never super passionate about it,” he said. Black’s homebuilding career started small. He did a small in-home job for himself, then started doing some work on his neighbors’ homes before graduating to the construction of his first full house, expressing an eagerness along the way to learn more. Eventually, he found himself at a crossroads in his career and realized he had a knack for homebuilding, so he reached out to numerous local builders for advice. He met with Elite Homes’ Joe Pusateri and now-executive director of the Building Industry Association of Greater Louisville Pat Durham, among others, for advice — and they steered him to join the BIA as he soaked up their wisdom like a sponge. Today, Black’s work is well-respected and award-winning as Artisan Signature Homes has been singled out for its craftsmanship and design acumen during the annual Homearama new home showcase. The 2018 edition of Homearama wrapped up at the end of July. The firm has featured several homes in the past two years of Homearama, which Black said “helps build that brand awareness” for a relatively new boutique firm with half-a-dozen employees. The company’s work also benefits from referrals, and Black said King helps keep the ship running through his laser-focused attention to detail and strong customer service. Artisan Signature Homes ranked No. 8 on our largest luxury homebuilders list with eight homes over $500,000 built in 2017. King has a similar background. Both men graduated from St. Xavier High School, played sports and then worked in the corporate world before venturing into the residential real estate industry. In King’s case, he earned a marketing degree from the University of Louisville and spent several years in the restaurant industry before becoming a homebuilder. Black praised King’s skills, saying he gives each client the white-glove treatment. “Jimmy is the realist. I am the idealist,” Black said. “I’m the dreamer. Jimmy is the doer.” But the customer’s desires are the backbone of their business. The men help guide clients in choosing each feature of their new homes and have accommodated some extravagant requests, installing spiral slides, hot yoga studios and cinema-level movie theaters in past homes. The results then come in the form of the customer feedback, from the client who deems a house “crazy, crazy gorgeous” to another who can’t believe this is their new home. “That’s very important to us,” King said. Who is your business mentor and why? Mike Grisanti. He is my uncle and is an experienced and successful businessman. From early on, he has always encouraged me to follow my passion and introduced me to wonderful life experiences and places that I still value today. Because of Mike, I pursued a MBA at Bellarmine, and that educational experience has helped get me where I am today. What’s one thing about your industry that is often misunderstood? There is a huge lack of young people going into the construction trade these days, so there is a labor shortage going on now and it’s only going to get worse with fewer people going into the trades. What’s the first thing you do when starting the work day? Coffee first then [I] head to check Instagram. What’s the best advice you ever received and how have you applied it in your life? Never give up and follow your passion in life. There isn’t a thing I would rather be doing. I love building homes and feel very fortunate to be able to do it for a living. I’m a pretty decent golfer and was the first Mr. Golf of Kentucky back in 1992. If you could have pursued another career, what would it be? Being that I love good design, I probably would have been an architect. Who would play you in a movie in a movie and what would it be called? What’s one thing you hope people say about you at your retirement party? When I first meet with a client, we have nothing but a blank slate and by the end of the project, we have an amazing dream home that’s a one of a kind. Also, being invited back to the homes we build and seeing our clients living in them and loving them is just a special feeling. Now that I have been building for 15-plus years, it’s fun taking that Sunday drive around town and showing the kids some of the cool homes we have built over the years.